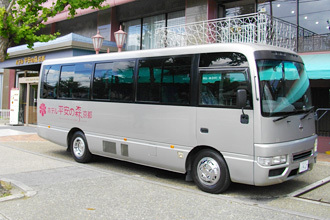 HOTEL HEIAN NO MORI KYOTO operated complimentary shuttle bus between hotel and Kyoto station everyday. The bus stop at Kyoto Station is near the EXIT Hachijo East. Please note that the bus service is on a first-come-first-served basis. For more details, please check the PDF below. Capable of seating:28. The bus service is on a first-come-first-served basis. If it's full, we may not be able to accept you to get on the bus. It takes around 30 minutes, however depends on the traffic jam. ● Approx. 30min by car from JR / Kintetsu Kyoto Station. ● Approx. 10min by car from Subway Marutamachi station. ● Approx. 5min by car from Keihan Jingumarutamachi station. ● Approx. 10min by car from Hankyu Kawaramachi station. Meishin Highway downbound - Kyoto Higashi IC - Sanjo street towards Okazaki for Approx. 20min. Meishin Highway upbound - Kyoto Higashi IC - Sanjo street towards Okazaki for Approx. 20min.